Straighten or curl your hair easily using the Ikonic mini 2 in 1 hair styler. 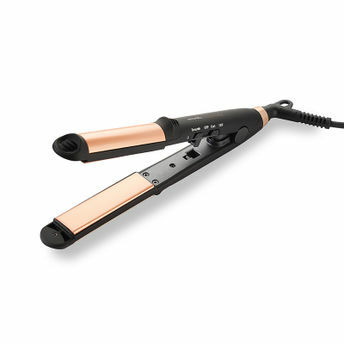 This travel-friendly multi-purpose hair styler works as a flat iron and curling iron. Straighten or curl tresses with this revolutionary tool - the outer plate housing instantly heats up creating the perfect design to achieve silky, shiny curls and waves. It also features ceramic-coated plates and a stainless steel outside barrel for sleek hair styles effortlessly. About the Brand: Ikonic Professional is a leading brand of professional hairstyling tools & accessories in India. Creating innovative and inspirational products with futuristic attitude is at the heart of Ikonic. With an extensive product range precisely designed to be user-friendly, Ikonic has been successfully catering to professionals with varied requirements. All the tools are designed with cutting-edge technology to bring you style, control and flexibility. Experience Ikonic to achieve your dream looks! Explore the entire range of Multi Stylers available on Nykaa. Shop more Ikonic Luxure products here.You can browse through the complete world of Ikonic Luxure Multi Stylers .